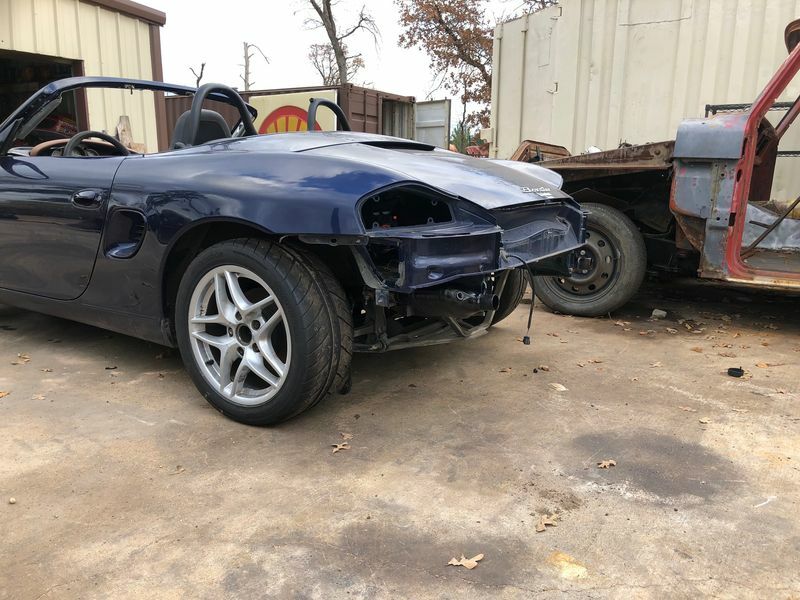 About two years ago I was at a SCCA autocross event and there was a Miata that was completely stripped of everything. 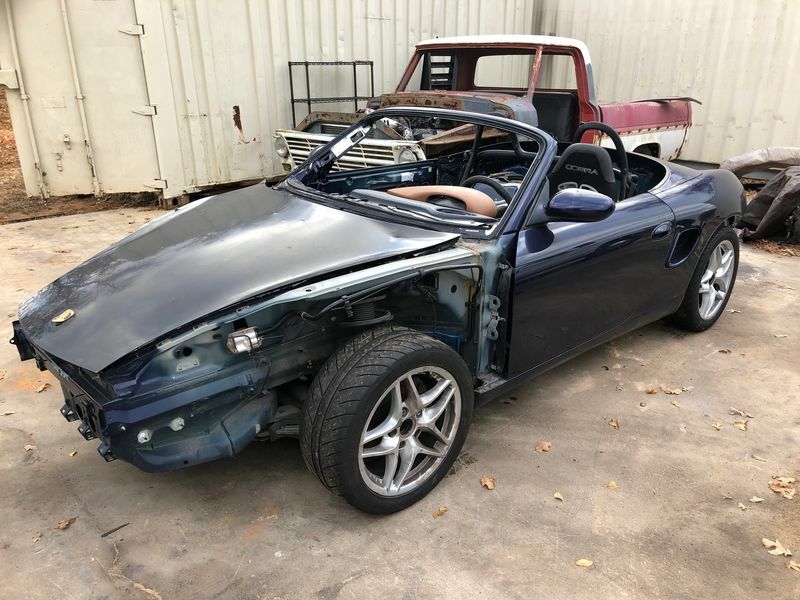 No body panels, no interior, nothing. It was just a bare bones rolling chassis. It was by far the ugliest car there but it performed pretty good. The theory is lighter is better and with autocross aerodynamics isn't as important because you don't really go that fast. 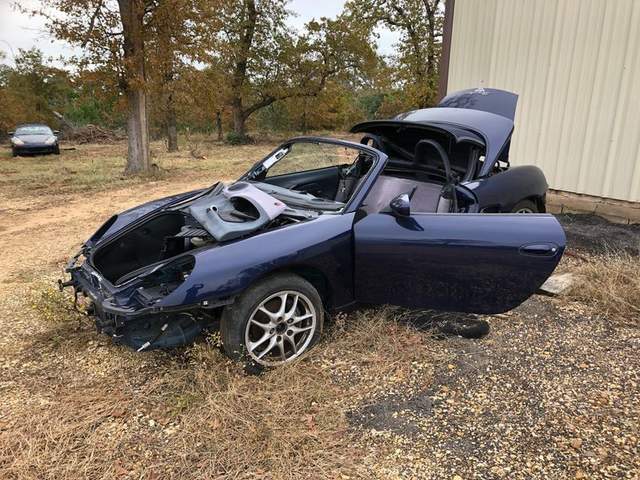 I thought it would be fun to do that with a boxster. I've been daydreaming about building one for years but never had the time or a good car to use. "Good" in as not wrecked and no one would buy the motor as soon as I got it. I got this car last year after hurricane Harvey. It was flooded but water didn't make it into the motor or transmission. The interior was shot but the car only had 72,000 miles and ran great once I put a good immobilizer in it. It's a 2001 2.7 manual. I rarely sell 2.7 5 speeds and 2.7 motors don't exactly fly off the shelves either. As you can see from the pic, I've been picking parts off it. I had a few bites on the motor but she's just been sitting for the last year. So I figure I'll have some fun with it since it's just sitting there. So here's my plans. I want to do just like that Miata. I'm going to remove almost everything that doesn't keep the car from moving. I want to make this thing the lightest I can make it. I also don't want to spend a dime doing it. In fact, not spending money trumps everything. The second most important thing is time, because I have none to spare. Removing weight is the easiest and cheapest way to make a vehicle perform better and I'm going to test that theory to the extreme. You're probably wondering what I'm going to do with it once I'm done building it? Well the first thing I want to do is a few autocross events. I know they won't care about the way it looks. I'd also like to take it to a drag strip for ****************s and giggles. See what she'll do in a 1/8 or 1/4. Heck why not right? If she makes it that far then I have some real fun planned for her on Easter. I have epic Easter parties. This year I plan on getting some beater cars and have a race around my property with them. I've already built the track on about 4 acres and have a 2000 camry and 1999 Legacy lined up to race. I plan on taking the racing slicks off and installing some 31 AT's on it to see what she'll do in the sand. My property is all sand so I'm hoping it doesn't get stuck. The subaru might kill it on the offroad track. I can't wait for Easter! So if the boxster makes it this far, then the great finale of it's life will be when I jump it over other boxsters. Hence the title"6 months to live". +2! Sounds like a fun project. I'm in, me too, want to see it. right on. hack off the windshield. i've heard there is 20+ pounds of rust-proofing on the underside of the car. 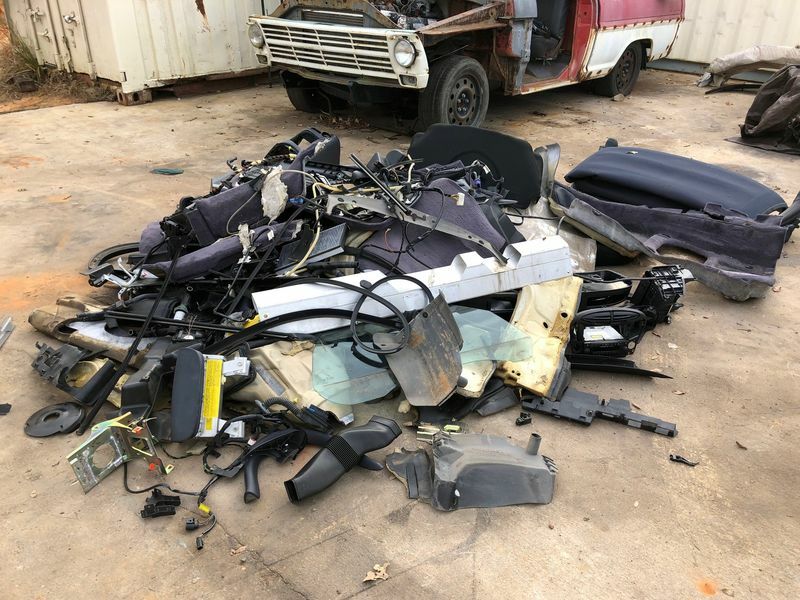 regulations require a roll bar or dashboard? probably need your interior door structure for rigidity unless you seam weld? drill holes in everything!!! don't need radiator fans, bumpers, charcoal canister, fender liners, underbody panels, headlights, abs. straight pipes are lightest. manual steering. I looked online, but couldn't find an article I read in Hot Rod magazine many years ago. They took a giant late '60's Pontiac sedan with a 455 cu-in V8 and wrote about the performance gains possible from reducing weight. They started out with 4 very large men and a trunk full of tool chests, and ran a 21 second 1/4 mile. They then set about removing weight with a cutting torch. By the end of the article, it was basically a bare chassis with a milk crate for the driver to sit on. They did put slicks on the drive wheels, because it was so light that it would just smoke the tires the entire 1/4 mile. If I remember correctly, they ended up with the car weighing less than half of it's original weight, and were able to get into the 11's in the 1/4. That is with no modifications to the engine or drivetrain, simply less weight. It will be interesting to see how far itsnotanova will go to remove the pounds from the car. Here's the pile of stuff going straight into the garbage. An equally size pile was saved to sell. I still have quite a bit of wiring to remove but I want to get the exhaust and cooling system done first. I've seen people go crazy ripping out wiring and then have issues. I plan on getting it running and then slowly removing unnecessary wiring. I spent a lot of today planning out how to modify the exhaust and cooling system. The 986 exhaust system is extremely restrictive and heavy. Mostly the catalytic convertors are worth money and that's the biggest reason I'm going to make my own exhaust. 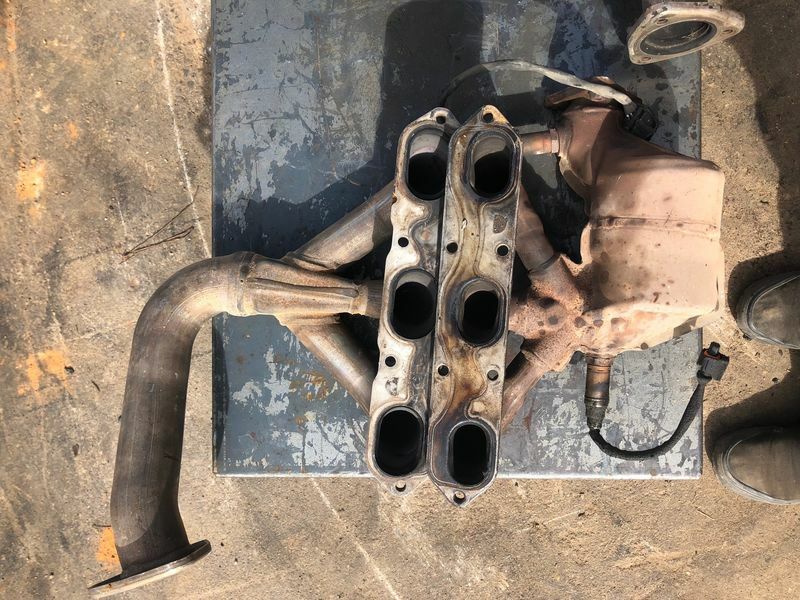 I had these 997 exhaust manifolds laying around. As you can see in the pictures, the difference in tube size is huge. Maybe even too much. They aren't a bolt in but I should be able to mount them and run the exhaust over the axles like the 987. For the cooling I've decided to use a 987 radiator mounted inside the frunk. I'll take some pics of that when I'm done. I remember seeing somewhere that a guy got his early 986 down to under 2100 lbs by removing as much as he was willing to. If I can find it again I'll have to see the specifics. Definitely interested in seeing where you end up! Edit: I found it. Someone got theirs down to 2080 lbs but had no windshield, etc. Before that he was around 2300 lbs. Awesome, can't wait to see how this ends up. Sounds like an adventure for sure.......I can't quite fathom the difference in exhaust tube diameter! 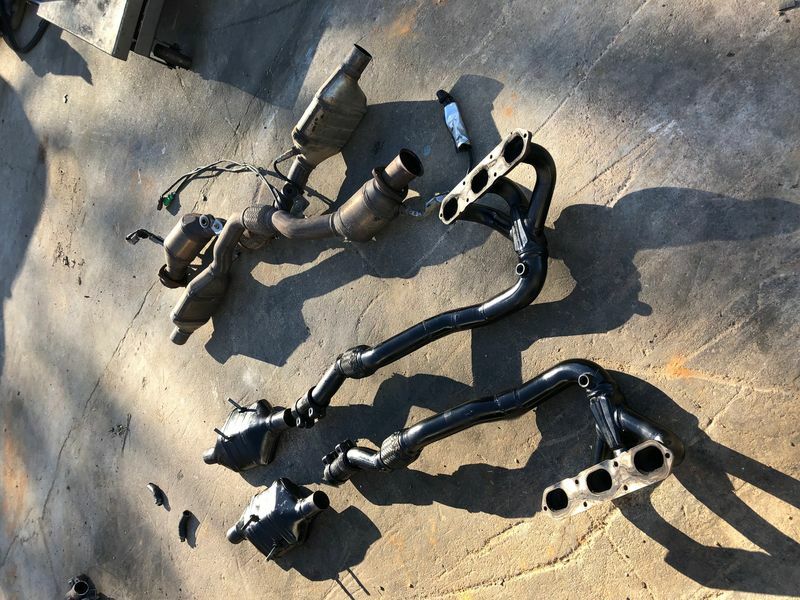 Those look like 3.2 manifolds....which one would think should be close to the 3.4. What are the respective engine displacements for each manifolds? @Mr Flat Six: Wouldn't recommend to remove the windscreen. 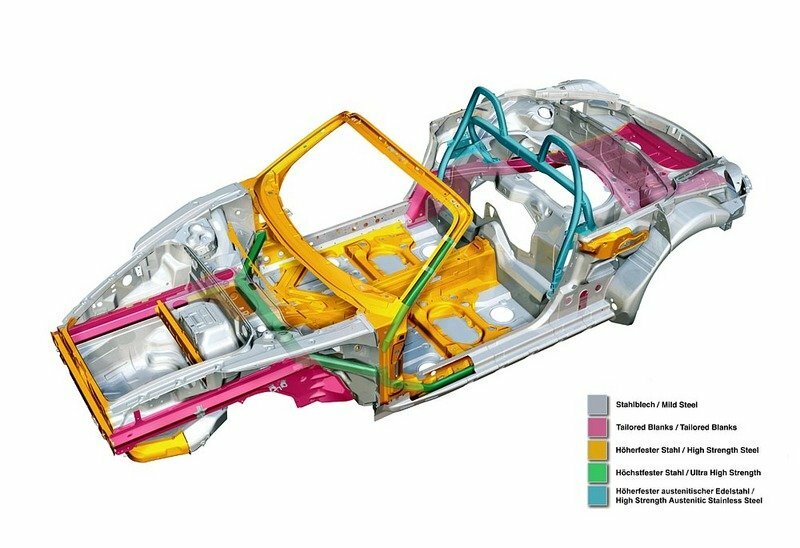 Windscreen frame and windscreen add a lot of stability to the 986 chassis. If you remove them you have to a a lot of weight to get the stability back. And if you want to use the car as a track tool, it's also a safety aspect to have a windscreen. @ Woody: all thumbs up! Just to comment, I definitely don't suggest getting rid of the windshield frame. I was just saying its been done before to lighten the chassis. Here's the exhaust I plan on using for now. 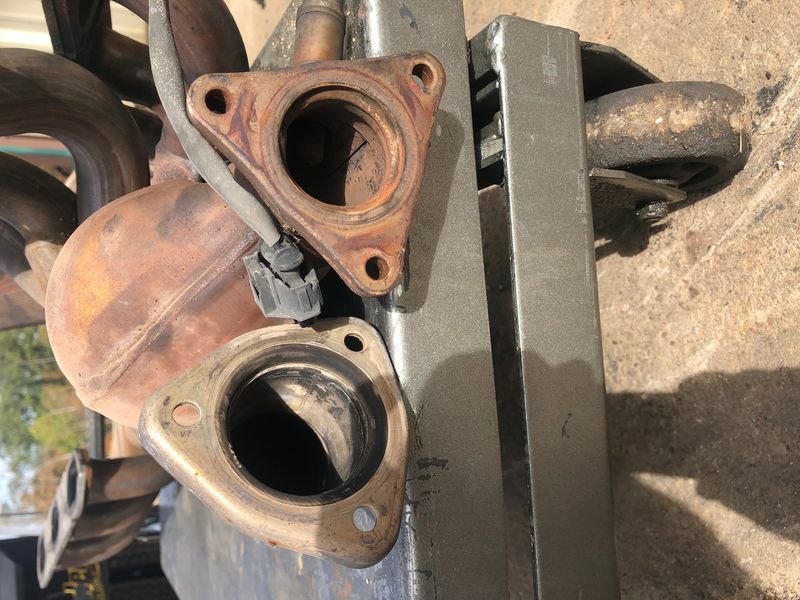 I took the 997 manifolds and added pieces off a B6 S4. The rear pieces are the catalytic convertors off the Audi. I'm using the cats as mini mufflers. With them off it's very loud. With them on it's just loud. I'll experiment with them on and off. I figure that I'll already be getting dislikes from the way the car looks. Ugly and loud might get me kicked out from events. I'm guessing the exhaust system weighs 15-20 pounds and the cats add another 10. On to the cooling system for today. As for the window frame. I'm definitely not putting a windshield back in it. I'm torn between cutting the frame off or keeping it. I do believe it adds some rigidity to the body but not enough to worry about. My biggest reason for keeping it is that I plan on jumping this thing and the rollover protecting might come in handy. That being said, I do think it would look cooler without it and will cut some weight. I'm still thinking about what I want to do. I'll be adding some reinforcement tubes for sure though. Ugly and loud might get me kicked out from events. Ugly might not be a problem as long at it's safe. The problem here is that the windscreen glass and the windscreen frame as constructive element add the rigidity. If you remove the glass you loose a lot of rigidity. You'll get the the best rigidity with windscreen frame, windscreen glass and sidewindows up. Without windscreen glass you'll get a lot more torsion in the front. Reinforcement tubes can shurely help. But in the end this should be a kind of full cage (left to right and front to back) if you don't want to use a windscreen glass. If you remove the door panels and the dashboard panel there will be enough room to do such a tube enforcement. But take care that there is enough space for yourself in case you have an accident and you don't can hurt yourself from how the reinforcement tubing is layed out (don't know if it's the right term – what i mean is where you put the tubing so it can't hurt you when there is an impact – so you have enough room for knees, elbows and so on) in the exterior. So safety always first. It can be ugly and loud as hell, but it has to be safe. Yes! We need more projects like this! I threw on some 17x8.5 wheels with Hankook RS4 tires I got from hanging around the track. You can find cheap tires at race events. I got these for free but you can expect to pay $20-25 a tire if you get lucky. There are some very rich guys who race boxsters and they're very competitive. They want the best and will throw away tires with lots of life still in them. I'm going to leave the box like this until I can get a vibe for where I'll be racing. 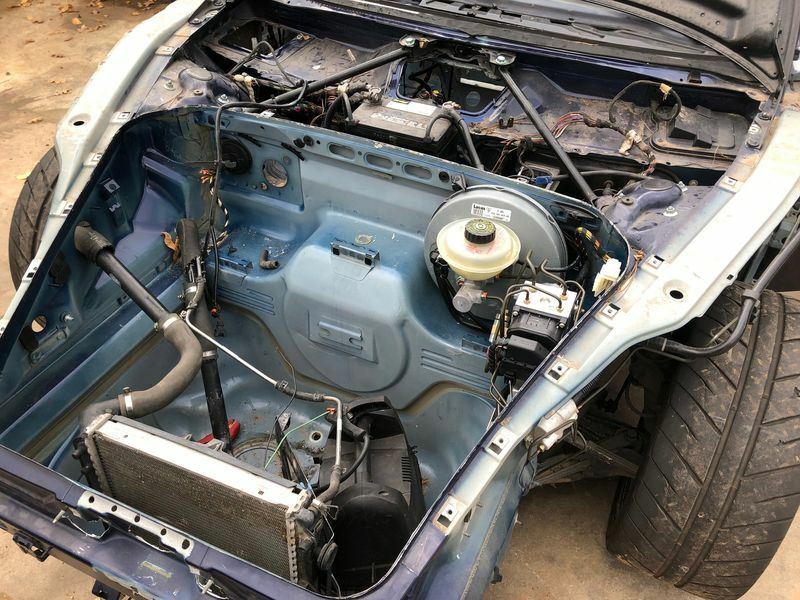 If the place is laid back then I'll remove the body panels to lose more weight. It only takes 5 minute to remove the hood, doors, clam and truck lid. This is probably where most of you are going to ask why I did this. I put the radiator inside the frunk for a few reasons. I went to one radiator to lose weight and make it simpler. One radiator for a car that won't be running for long periods of time should be enough. The biggest reason is that the radiator mounted on the side can not handle the abuse I plan on putting it through. Being in the frunk should help protect it. I just need to build a mounting frame for it. I let it idle for about a half an hour with the hood closed and it stayed at 180. 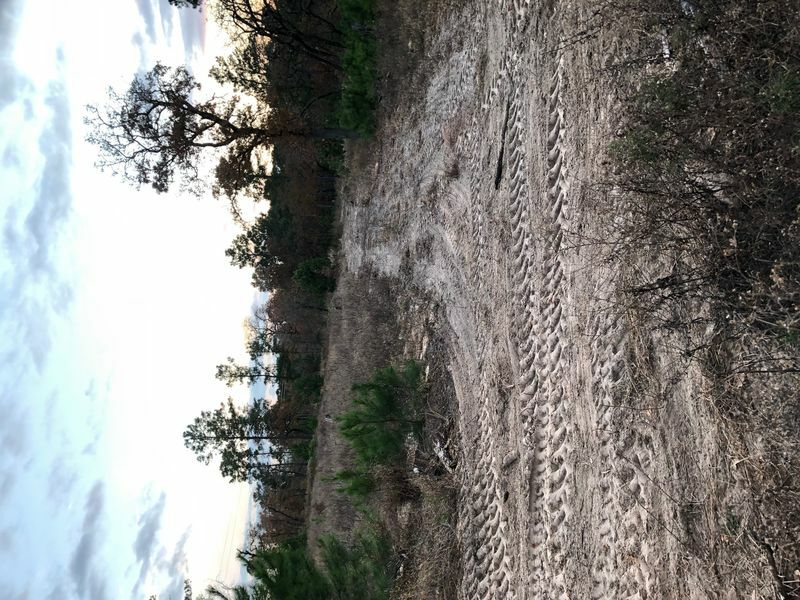 I spent some time clearing for the track on my property. Here's the straight section. The total track is about 1000 yards. I had to keep it small so I could see the whole track from one spot. The first group to race are teenagers. Almost forgot to add that I took it for a quick spin down my street. It probably wasn't the smartest thing testing how fast a car can go when there's no brakes, and the seat and steering wheel weren't bolted down. It laid rubber for 20 ft though! Last edited by itsnotanova; 11-29-2018 at 04:18 PM.